Caleb Scott switched his uniform as quarterback for the Life Christian Academy Eagles for one as “Superman” to make a visit to leukemia patient Peter Wellner Oct. 27 at Children’s Hospital in Oklahoma City. 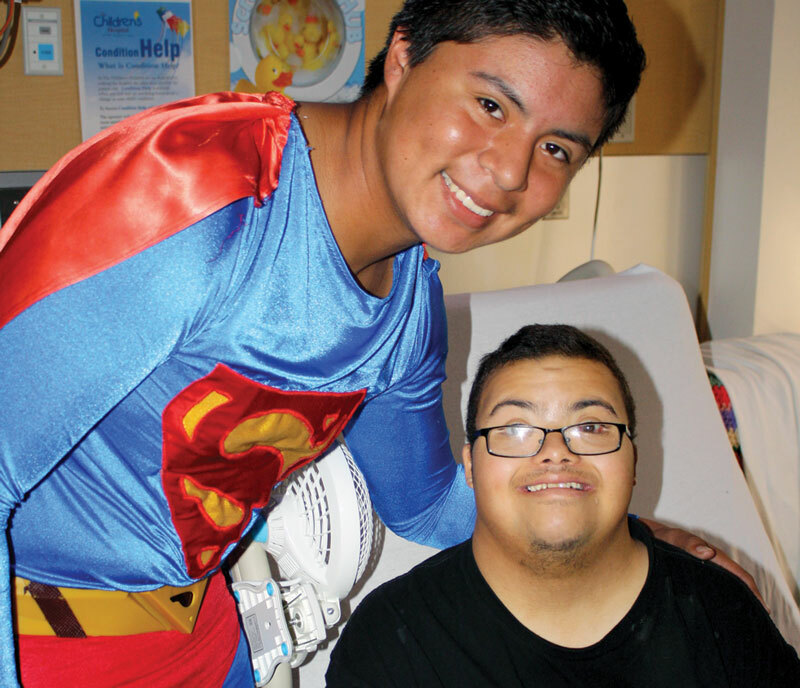 LITTLE AXE—What would prompt a 15-year-old, star varsity quarterback to risk the ridicule of his classmates and others by donning a Superman costume and visiting a sick teen in the hospital? The love of Christ in his heart—that’s what. Peter Wellner of Purcell is 17 years old, and has Down’s Syndrome. He loves the DC Comics super hero, Superman. Been that way ever since anyone can remember. Peter’s mother, Kristina, works in the cafeteria at Little Axe Elementary School, alongside Cindy Scott, wife of Bryce Scott, pastor of Little Axe, Cornerstone Indian. Peter loves to emulate the Man of Steel so much that he also takes on his earthly alias from time to time. When he comes to the school to visit his mother, he signs in as Smallville’s Clark Kent. A dose of reality shattered Peter’s comic book world the weekend of Oct. 19, however, when he was diagnosed with Leukemia. That weekend, Cindy Scott and her oldest son, Caleb, a sophomore at Life Christian Academy in Choctaw, went to visit Peter in the hospital. Caleb, who is almost six feet tall, and weighs 210 pounds, is the starting quarterback for the Life Christian Eagles. Similar in body configuration and playing style to University of Oklahoma signal caller Blake Bell, one of his teachers calls him the “Calebdozer.” He also plays on the school’s varsity basketball team. Kristina Wellner smiles as her son, Peter, reaches out to greet “Superman” in his hospital room at Children’s Hospital in Oklahoma City. 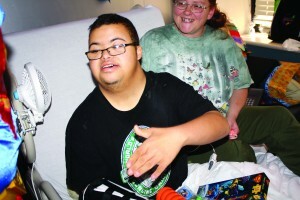 Peter, who has Down’s Syndrome, was diagnosed with leukemia recently. So, after obtaining the use of a Superman costume, thanks to a gracious gesture by the Costume Fun House of Oklahoma City, on Sun., Oct. 27, Caleb donned the Superman costume and had a special visit with Peter at Children’s Hospital in Oklahoma City. “Peter’s mother said he had not felt well all day, and hadn’t been able to sit up, but when he saw ‘Superman’ come into the room, he sat up in bed and had a big smile on his face,” Bryce Scott said. “Peter was in awe that Superman had made a special visit just for him. Peter promised Superman he would take his medicine and do whatever the nurses asked. At the conclusion of our visit, we had a prayer time with Peter and his mother. “That day, I saw the Lord’s love preached louder than any sermon I have ever delivered behind the pulpit,” he concluded. “I am thankful to God for giving us a son who shows the Lord’s love in action.